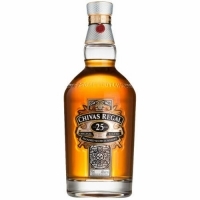 Chivas Regal 25 is a rare and exclusive blend of the finest Scotch whiskies, available only as a strictly limited release in individually numbered bottles. Nose: Enticing fruity aromas of sweet orange and peach, followed by notes of marzipan and nuts. Taste: Hints of rich, mild, chocolate orange, and a fondant creaminess. Finish: ESmooth, rounded and luxuriously long.